When you work hard for your money, like we all do, you want to be sure you’re spending it wisely. And when it comes to home ownership, some investments are required to keep your home maintained from year to year. Other expenditures are made in the way of improvements. Investing in your home not only increases its value, but it also can provide a return. So, how do you know which updates to take on if you’re looking to get the most bang for your buck? As reported by the National Association of Realtors (NAR) and Remodeling Magazine in their “Cost vs. Value Report,” not all home improvement projects provide a substantial return on investment. Let’s take a look at some of the best interior renovation projects to recoup the largest percent of money spent. 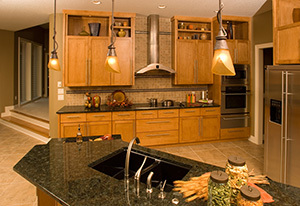 When it comes to remodeling your kitchen, there are two options you can choose from. The first possibility is the total remodel. In addition to providing the most up-to-date trends in cabinetry, flooring and modern appliances, a full kitchen remodel also allows you to update your layout and improve workflow and efficiency. If your budget doesn’t allow for a complete kitchen makeover, or you know you’ll be selling soon, a kitchen facelift also can provide a significant return on your investment. With a kitchen upgrade, the footprint and cabinetry stay the same, but the countertops are replaced with quartz or granite, a new tile backsplash can be added, and flooring and lighting can be upgraded. “You get a new, modern-looking kitchen, spending maybe half or less than what you would spend on a whole remodel,” Readnower said. A caution with this approach: if your cabinets are old or in rough shape, replacing everything else around them will just make them look worse. Using this partial upgrade method has to be carefully considered. Bathrooms, like kitchens, are another room in the house that, with a complete or partial renovation, can result in big improvements and money back against the bottom line. Whereas the cabinets are the anchor in the kitchen, in the bathroom, it’s the tub. Sometimes you can update around the bathtub, with a partial renovation, if the tub is in good shape. In some renovations, homeowners are opting to remove the tub entirely and replace it with a walk-in shower. 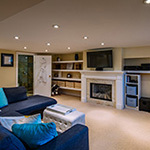 Completing unfinished space in a home, like a basement or attic, is a great way to add living space and value. 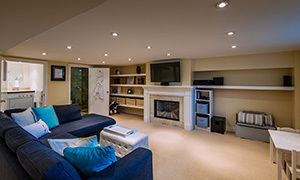 When it feels like everyone is living on top of each other, expanding living space into the basement is a good option. Making informed decisions about how to improve your home for your family, while at the same time considering resale value, is important in every home improvement decision you make. Work with an experienced contractor each step of the way, and whether you’re doing a complete remodel or a fancy facelift, you’ll have a finished space you can enjoy and that adds value to your home.